Sarah Bullock and the Tigers are a perfect 6-0 at home this season. Tonight’s home match against LSU could not come at a better time for the Auburn volleyball team. After two lackluster performances last weekend on the road, where the Tigers have struggled all season, Auburn will look to rebound tonight at 7 p.m. in the Student Act Center, where they have yet to lose a match and have only dropped 3 total sets all season. Auburn lost both matches in its road series last weekend, falling to Georgia, 3-0, and No. 11 Florida, 3-0. This weekend’s home series, starting with tonight’s match against LSU and continuing with a match Sunday at 1:30 p.m. against Missouri, could be an opportunity for the Tigers to reset and regroup. 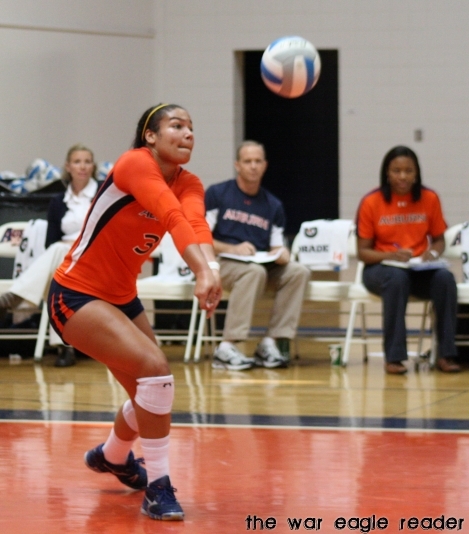 “It’s always good to be home,” said Auburn volleyball head coach Rick Nold. “There’s no doubt about that. We obviously want to take advantage of being at home. At the same time, at our next opportunity, we need to improve at how we play on the road. We’ve got to get back and change some things. For senior outside hitter Sarah Bullock, picking up a pair of wins this weekend starts with how the Tigers play each match out of the gate. The Tigers will have an opportunity to set the pace in tonight’s match. LSU stands with an 8-11 overall record, 4-6 in SEC play. Bullock says that tonight, and in Sunday’s match against Missouri, the Tigers will have an opportunity to make up for some disappointing losses earlier in the season. Admission is free for both matches this weekend. TWER photo by Abby King.